Nothing inspires our team more than vibrant combinations of color! 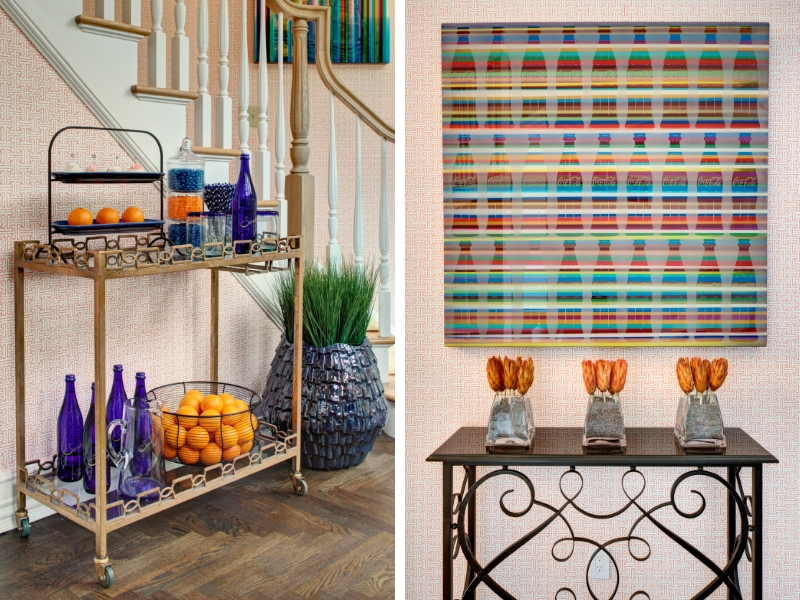 As participants in the 2014 Designer Showhouse of New Jersey, we made use of bold color to create a vibrant informal dining space. Welcome to the Breakfast Room! The house, a sprawling French Chateau estate in Saddle River, experienced a complete transformation at the hands of 17 interior designers and landscapers. With full authority to renovate their assigned spaces without limitation, each room was a reflection of the individual designer’s personal aesthetic and philosophy. Our team was invited to transform the Breakfast Room of this majestic estate. At first glance, there were a few immediate challenges to address. First, we wanted to define the space and create a floor plan that worked with the irregular shape of the room. That meant first determining what furniture was needed to achieve a functional dining space. For us, this included a dining table, chairs, and a beverage cart. Naturally, a round dining table was the best solution given the room’s octagonal shape. The 60-inch round Numera Dining Table from Harden Furniture was the perfect size to seat a typical family of four, plus one. It also left enough circulation space around to take a moment by the window or pour a drink at the beverage cart. While adding a layer of texture to the ceiling draws the eye upward, our other trick for making sure ceilings get their fair share of attention is getting that chandelier, in this case, a Visual Comfort Choros Two-Tier Chandelier in Aged Iron, height just right. Typically, we suggest dining room chandeliers float about 30-34-inches above the dining table. But I think we can all agree, some rules are meant to be broken! For this space, a hanging height of approximately 40-44-inches above the dining table creates a nice balance between the ceiling and provides clear sightlines through to the exterior landscape. Our third challenge was determining the best window treatment to highlight the grand windows, a significant element in the architecture of the Breakfast Room. The informal nature of the room called for a more casual look. Therefore, we opted for custom roman shades in a multi-colored cotton print from Duralee versus full-length draperies. Being that the exterior views are quite private, these shades served the purpose of adding another soft element for acoustical purposes. Eye-catching pop art from Mark Gallery adorn the walls leading into the kitchen and up the stairway to the second level. An Alfresco area rug from Surya anchors the dining table and chairs. Florals from Creative Displays add some much-needed greenery to the vibrant palette. And homewares from various retailers play into the lively color story of the Breakfast Room. 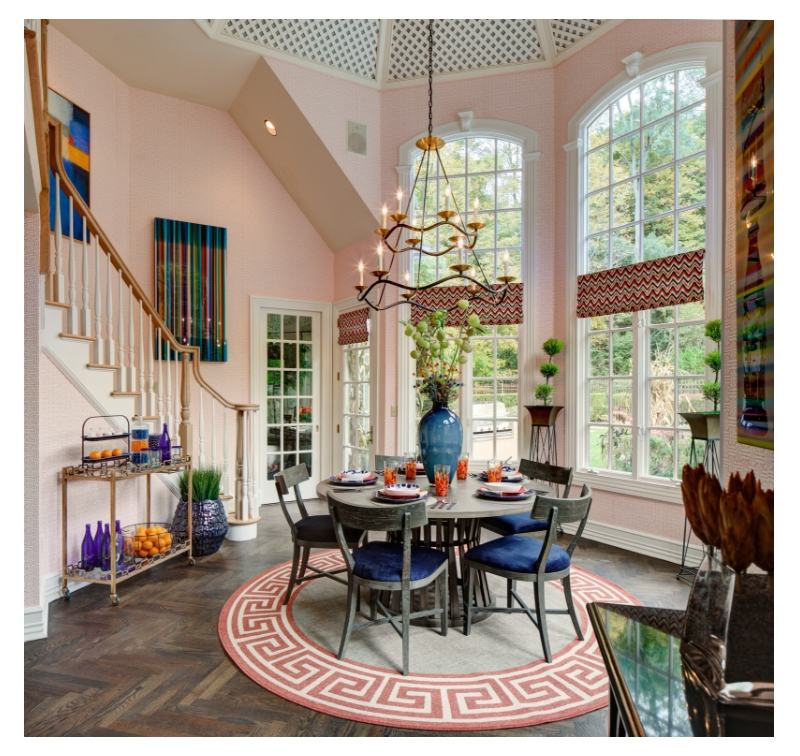 This showhouse allowed us to show our love of bold color to create a vibrant informal dining space while supporting a great cause. If you envision a colorful, lively home, let’s connect and see how we can help! Contact our team to see how we can get started. Be sure to follow our blog for more project highlights and showhouse designs, like our Hampton Coastal Master Bath.